Take our short survey to tell us help us deliver useful information and resources in 2016. The survey is anonymous and will only take a few minutes. This conference will bring together city planners and managers, water resource professionals, researchers, and other stakeholders to identify resiliency best practices and ways to foster integrated water management. 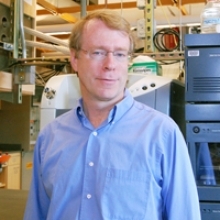 The Water Innovation Network for Sustainable Small Systems (WINSSS) Center at the University of Massachusetts-Amherst is led by Dr. David Reckhow. The WINSSS Center brings together a national team of experts to transform drinking water treatment for small water systems to meet the urgent need for state-of-the-art innovation, development, demonstration, and implementation of treatment, information, and process technologies in part by leveraging existing relationships with industry. One of the objectives of the EPA National Drinking Water Centers is to advance appropriate innovative technologies for small drinking water systems to actual implementation. The goal of one of the WINSSS Center projects is to accomplish this objective for the use of ferrate, a so-called “green” oxidant chemical with long-held potential for significant impact in treating water sources. In ferrate (one species in water is FeO42-), iron is in the +VI oxidation state and has the ability to oxidize a wide variety of constituents in water; examples include inorganics such as reduced manganese, iron, arsenic, and sulfide, organics such as natural organic matter (NOM) and microorganism components, and trace anthropogenic contaminants. The “green” label for ferrate is because the by-product of the ferrate oxidant is iron in the +III oxidation state, or ferric iron, and, of great importance, there does not appear to be formation of harmful species (which is often not the case for some other strong oxidants such as ozone and chlorine dioxide). The ferric iron is very insoluble, resulting in formation of particulate iron that is removed effectively by various processes; the ferric iron may also contribute to effective coagulation and has the potential to adsorb certain constituents (e.g., arsenic (V)). An additional significant potential benefit of ferrate is that it is known to be a very effective disinfectant, similar to the dual function of other strong oxidants such as ozone and chlorine dioxide. A ferrate sollution. Photo credit: J. Goodwill. For a prior USEPA-funded project at UMass Amherst, we conducted numerous laboratory experiments on various natural waters to explore several aspects that are critical for the implementation of ferrate treatment. Findings regarding the decay of ferrate (Jiang et al, 2015a), characterization of the iron particles formed from ferrate (Goodwill et al, 2015), and use of ferrate pre-oxidation for continuous flow surface water treatment (Goodwill et al, 2016a) have been published while important findings on the impact of ferrate oxidation on disinfection by-product (DBP) precursors (Jiang et al, 2015b), the lack of formation of bromate from bromide at levels of concern (Jiang et al, 2016), and the oxidation of reduced manganese (Goodwill et al, 2016b) have been submitted for publication. The WINSSS ferrate project is focused on demonstrating the potential for implementing ferrate for continuous flow treatment of drinking water sources. Initial work is focused on low-flow pilot experiments in the UMass laboratory (see photo below) while future work will include use of the WINSSS mobile pilot trailer or other pilot-scale facilities on-site at source waters. Currently, we are preparing to pilot the use of ferrate for intermediate oxidation due to the significant impact on DBP precursors for this point of application found during batch experiments (Jiang et al,2016a). Ferrate will be dosed after particle removal by clarification (which follows coagulation and flocculation) but prior to granular media filtration, similar to the application of intermediate ozonation. 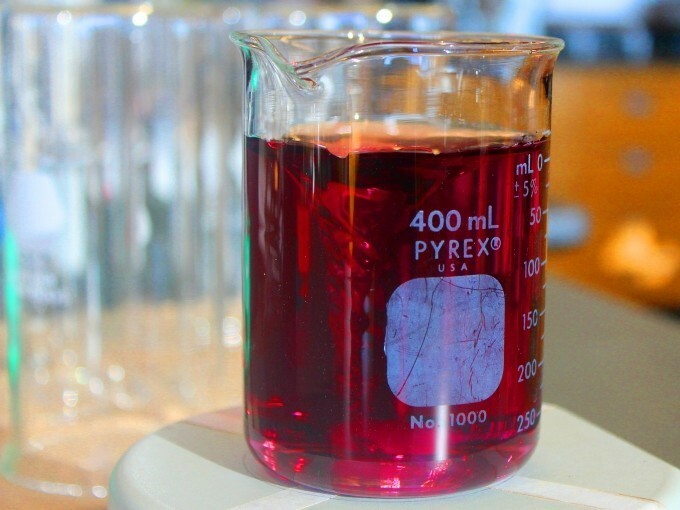 Advantages include increased oxidant impact due to removal of NOM DBP precursors by coagulation and clarification while a disadvantage is the need to remove iron particles formed from ferrate in the subsequent media filtration process. Measures of process performance will include DBP precursor and NOM removal, as well as particle removal and head loss development for the media filtration. Look for results in future communications from the WINSSS Center! Goodwill, J.G., Mai, X., Jiang, Y., Reckhow, D.A., and Tobiason, J.E. (2016b) “Evaluation of manganese(II) oxidation by ferrate for drinking water treatment, submitted to Water Research, February 2016. Jiang, Y., Goodwill, J.G., Tobiason, J.E, and Reckhow, D.A. (2015a) “Effect of Different Solutes, Natural Organic Matter, and Particulate Fe(III) on Ferrate(VI) Decomposition in Aqueous Solutions”, Environmental Science & Technology, Vol. 49, pp. 2841-2848, Mar 2015, DOI 10.1021/es505516w. Jiang, Y., Goodwill, J.G., Tobiason, J.E, and Reckhow, D.A. (2015b) “Impacts of ferrate oxidation on natural organic matter and disinfection byproduct precursors”, submitted to Water Research, December 2015. Jiang, Y., Goodwill, J.G., Tobiason, J.E, and Reckhow, D.A. (2016) “Bromide Oxidation by Ferrate(VI): The Formation of Active Bromine and Bromate”, accepted subject to minor revision, Water Research, February 2016. 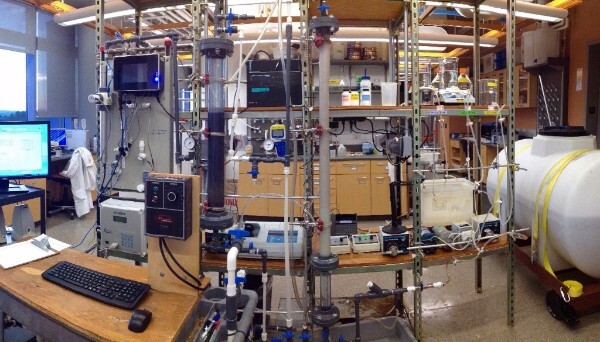 The laboratory continuous flow pilot apparatus. Photo credit: J. Goodwill. 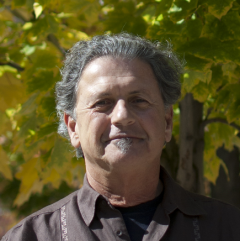 The Design of Risk-reducing, Innovative-implementable Small-system Knowledge (DeRISK) Center at the University of Colorado-Boulder is led by Dr. Scott Summers. The DeRISK Center’s overall objectives focus on applying principles of risk reduction, sustainability and new implementation approaches to innovative technologies that will reduce the risk associated with key contaminant groups and increase the chance of adoption and sustainable use in small systems. Remote rural small communities often have increased challenges with respect to providing safe drinking water compared even to their semi-urban small system counterparts. These challenges are often linked to the community’s lack of connectivity to an urban center limiting availability of parts, skilled labor, and technical expertise. For example, in rural Alaska a representative remote rural community is not connected to any other community via roadway. These communities typically maintain a small airstrip and are often located on a river. Citizens use the river as the primary means of connecting communities via boat in the summer or vehicle (car, ATV, or snow machine) in the winter. Shoulder seasons where the river is freezing or thawing often result in the inability to travel to nearly communities by these means. Furthermore, goods are imported in small quantities by plane and large quantities by seasonal river barge. Through the research team’s interaction with rural Alaskan communities, they have identified that the current methodology of seeking assistance in case of a treatment challenge is to to seek help from (1) a neighboring community and (2) a community-assigned Remote Maintenance Worker (RMW, a state supported position to assist for water and wastewater infrastructure issues). If the question is in regard to a treatment process, there is a possibility that a neighboring community does not employ this technology and therefore may not be able to provide the assistance needed. The assigned RMW is likely to be able to help as they (1) may have previous knowledge of the treatment process or know of another community within the assigned region or (2) have contact with other RMWs across the state that can assist. While functional, this methodology is very people centric and can fail due to communication breakdown. 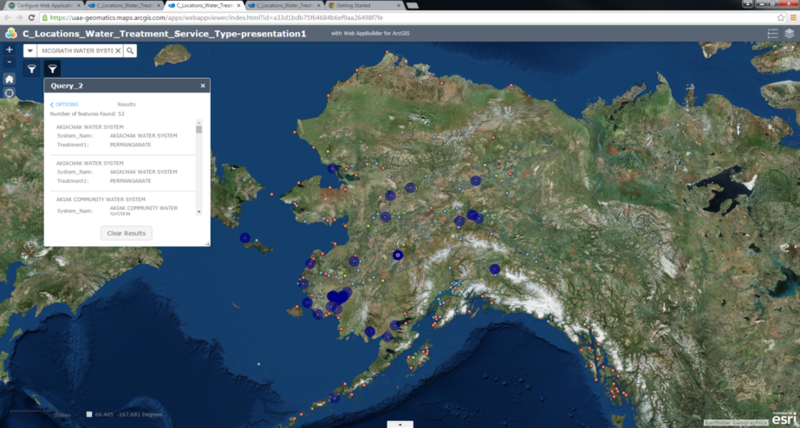 Our research is exploring how graphically querying and graphically presenting the State of Alaska’s Safe Drinking Water Information System (SDWIS) database provides another avenue of assistance focused on treatment technology. The image below presents the results of a query of a treatment technology shown in purple with a light center indicator. All other small systems with regulated water treatment facilities around the state are indicated in red, green, or blue. The systems with a similar technology are shown in purple. In the case of the community in question, it is observed that their direct neighbors (while few) do not have a similar technology. This community would have to look to coastal communities in the Yukon-Kuskokwim Delta or Inland for technology assistance. In the next year, we will be interviewing RMWs with respect to the typical treatment technology issues they are are asked about. Through these interviews, we will compare the method that was used to overcome the issue and overlay how this graphical methodology could have been used in the effort. Further, the team will be looking into how the SDWIS databases of other states compare to that of Alaska and evaluating how this methodology could be expanded to assist remote rural communities in other states as well as how this methodology could be used for other applications. Bausk, A.S. and Dvorak, B.I. (2016). Selecting the column configuration with the lowest media replacement cost for small adsorption systems. Water Research, 93, 38-47. doi:10.1016/j.watres.2016.01.015. Why it's interesting: This study presents a framework that could be used to identify the adsoptive media system column configuration with the lowest annual replacement costs. Janzen, A., Achari, G., Dore, M.H.I., and Langford, C.H. (2016). Cost recovery and affordability in small drinking water treatment plants in Alberta. Journal of the American Water Works Association (In Press). doi:10.5942/jawwa.2016.108.0047. Why it's interesting: Among the 25 Alberta communities with populations less than 1,000 sampled for this study, only half recover the marginal cost of treating drinking water. Bazri, M.M., Sarathy, S., and Mohseni, M. (2016). Journal of the American Water Works Association (In Press). doi:10.5942/jawwa.2016.108.0050. Why it's interesting: Strongly basic ion exchange resins used as a pretreatment process for UV/H2O2 advanced oxidation can efficiently and simultaneously remove DOC, sulfate, and nitrate to different extents under practical conditions. The U.S. House of Representatives voted 416-2 in favor of a bill that would strengthen public notification requirements related to lead levels in drinking water. The White House budget plan includes a $157 million increase to the Drinking Water State Revolving Fund. In this interview, AquiSense Technologies President Oliver Lawal discusses the company's UV-LED lamps and plans for additional disinfection products.